2017 Volvo S60 or V60 Cross Country (AWD) w E-Drive (4cyl, 8speed auto): Like it?? Want to hear from anyone who has a V60 CC or S60 CC Volvo with the \"E-Drive\" (4 cylinder, 8-speed transmission). Love the looks, utility, and size of the Cross Country version of these vehicles, but there is VERY little out there on the internet in terms of reviews or reliability stats yet, and my local dealers have none in stock for test driving - they have only a couple 2016 S60 CCs with the 5-cylinder 6-speed which I\'ve read can be doggy & unimpressive. Can you tell me how you like the steering/handling & power response on your Volvo? And/or can you compare it to any other cars that I might be able to actually test here? And of course...reliability: Any issues yet? 1. I wanted a station wagon and not an SUV. 2. I also wanted a vehicle with a stylish design inside and out. 3. Ground clearance (min 7") was very important since I spend several months a year driving in Mexico where most towns and villages have some really high topes (speed bumps). 4. Good performance was necessary to enable easy overtaking of large trucks on minor roads. 5. Comfortable seats were necessary for our long trips. 6. Easy to load luggage space with folding seats. 7. Emergency spare wheel standard. 9. Numerous safety systems included. 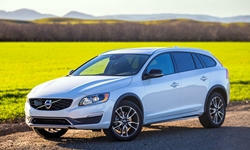 The V60 has AWD, a 250HP 5 cylinder turbo with a 6 speed manumatic transmission. 0-60 mph takes ~ 6.6 secs and ground clearance is ~ 8". So the V60 CC meets all of our requirements and then some. The Birchwood leather seats not only look great but are really supportive and super comfortable. The car handles really well on twisty roads (I used to race sports cars and know handling) and when roads are wet. It can easily cruise at triple digits too if desired. The engine has a nice growl when accelerating but is unobtrusive when cruising. The rear view camera and front and rear sensors are a great help when parking in tight spots and eliminating (hopefully) minor scrapes. Automatic folding mirrors is a very useful feature when parking on narrow streets too. The Nav system is easy to program and to our pleasant surprise it includes Mexico! Neither the Volvo website or the dealer was aware of this. After 11,000 miles I am still learning about some of the features that are thoughtfully included. Overall I am very pleased with the V60 CC and have had numerous compliments about it. This model is quite rare and I have only seen 3 other CCs in our home city (Austin) where BMWs and Mercs are very common - which is rather nice. We bought a 2015.5 V60 CC last October to replace our 2009 Saab 9-3 Aero wagon which suffered greatly from having a crap GM motor. Though the Volvo isn't quite as peppy and it suffers greatly from Automatic Transmission, it is quick enough with the turbo and the handling is fine - It's a slightly raised wagon so the handling is never going to be fantastic but it is as good as the Saab was, or even better - I don't notice as much body roll. We thought about an A4 Avant only to find it was no longer available - only the Allroad - and the price was much more, the power not as good and my wife and I prefer the 'Swedish' interior to the German clutter. We settled on the 2.5T because the car we bought was a current year demo with very low KM, for about $18k off sticker and the 160,000KM bumper to bumper warranty. So less money, more warranty, OK. Made the mistake of driving the Polestar top end $70k car and now nothing else is good enough, but this is a wonderful car. I love the interior comfort and the driving aids like the adaptive cruise etc. are all very well put together. My wife had a Nissan Sentra as a rental the other day. I drove it for about 30 seconds and appreciated the Volvo. It IS a very nice car. You get spoiled quickly. It has the most comfortable seats i've sat in, ever. Ours has the upgraded sport seats. The regular seats were also good, but not this good. Best seats on the market. Ours does not have nav but if we ever feel like getting royally screwed over we can pay $1500 to have it activated by the dealer. It's in the car, but we are not allowed to use it. This is a pet peeve of mine. Ours also came with a spare tire, which apparently isn't common anymore for some silly reason. Seriously. We have the old-school 5 cylinder. We were led to believe by the dealer that the Polestar tune would be available, so we bought it instead of a regular V60 T6 or R package V60. It seems now that the Polestar tuning is not available for the 5 cylinder so we were misled by the dealer. I would much prefer 300HP but realistically my wife drives this car 20km per day and I rarely drive it so it isn't a dealbreaker. More upset that the dealer lied to us than anything. There are a few really stupid things that this car does that I do not like or understand. For example if I start the car from the phone app (the ability to do this for the next 6 years cost $700 - another thing not disclosed by the dealer) when i approach the car and touch the handle - even with the fob in my pocket - it kills the engine. Then I get in and restart right away. Not sure why this is necessary. None of the cool connected car goodness is available in Canada - no good apps, no real reason to pay for it. At least I can tether to my phone data package rather than have to pay for another just for the car like with a GM car. Internet is useless without a touchscreen anyway, I'm not navigating the little wheel thing to go to a website. Our car did not come with TPMS. Not sure why, maybe they forgot to put it in? Why would a loaded Volvo not have this? Overall I would buy the car again but I think I would also consider an R design XC60 with more engine. Same frame, same everything with a bit more interior space maybe, and still looks great. I'm curious to see how many of these fancy new engines explode, and how good/bad the real world fuel economy is. I see quite a few of the new XC90 around, which I'm happy about because being a long time Saab guy I like to see the Swedes do well and they certainly deserve to, having quietly built very good cars for may years without the douchebaggery that seems to surround the German badges.